I've got a Question about the G32 Probing. I use this bed.g in my System Directory and calculated my own Probe Points but it looks like he ignores them for some Reason. Any Ideas what i can/should change? I'm no expert, but just an idea as its an easy mistake to make, do you have the probes offsets set correct in the config.g file? As the probe is on the left side of the nozzle you'd need to use minus values in the X axis at least to set it's position in relation to the hot end. So if you are using positive values it would add that value to your start point coordinates. What is your probe offset? Adding G31 (probe offsets here) to your bed should help. Edit: Coolice beat me to the punch. The Probe is 18mm and is from the Nozzle to the Center of the Probe about 40mm away. and change eatch Value on the bed.g by -40 ont the X and -30 on the Y? Just add the G31 P600 X-40 Y-30 Z1.15 ; Set Z probe trigger value, offset and trigger height to your bed file, before the probing points, and it should adjust for you. Ok shure i can try that but if you look on the Pictures it got a offset aswell on the Y.
I will try to check the 30 again but it looks to mutch for me. I checked again the Distance from the Y to the Probe center and see what i get… 14mm instead of 30. The Orange Sheet is 200x300 but the Alu Plate got a other size. This is the first Position where he starts probing…. 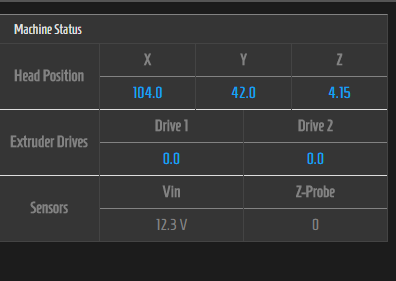 If i set it to X0 and Y0 in the Probe Offset it does his job ok. The firmware will attempt to put the probe (not the nozzle) at the XY offsets you specify, taking into account the probe offsets that you declare in the G31 command. The offsets are the X and Y distances from the nozzle to the probe, not the other way around.